The establishment press is making a big deal out of the fact that President Trump has not been and will not be personally invited to a climate summit in Paris in December. Both the media and the folks running the summit, where the utterly unoriginal theme is "Make Our Planet Great Again," should be thanking the U.S. for its outsized contribution — but to be clear, unnecessary, given that the link to "global warming" CO2 increases has not been definitively established — to carbon dioxide reduction. According to Reuters, "The United States would still be invited to the summit but at a lower level than the president." Though the UK Daily Mail is describing the action as a "SNUB," it's hard to imagine that Trump is feeling particularly bothered by it. 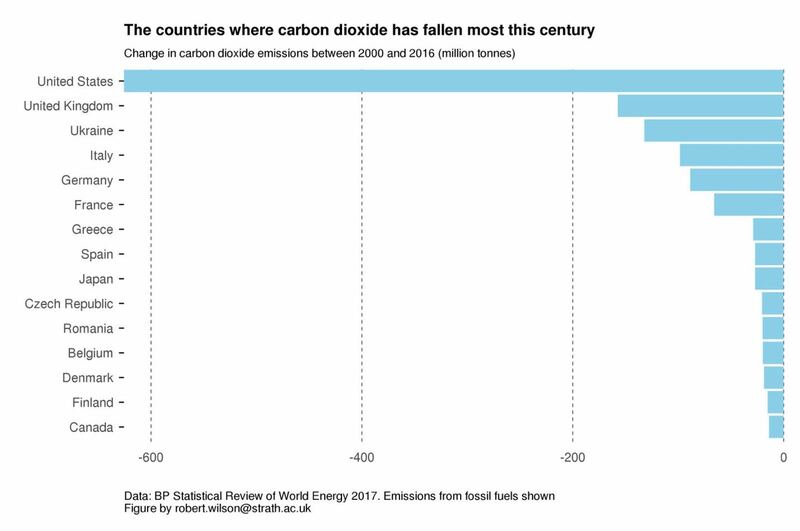 There's certainly good reason to believe that wannabe controllers of the world's economy who want to use bogus "climate change" claims as their premise for doing so aren't interested in letting people know which nation has reduced its carbon footprint more than any other. That's because that nation is the United States. Hinderaker adds: "America’s frackers say: you’re welcome." U.S. carbon dioxide emissions from energy sources are expected to hit a 25-year low in 2017 as the power sector burns less carbon-intensive coal and more low-cost natural gas, according to government data released Tuesday. ... Energy-related carbon dioxide emissions were expected to fall to 5,134 million metric tons in 2017, which would be the lowest since 1992, before rising to 5,248 MMT in 2018, according to EIA’s latest Short-Term Energy Outlook (STEO). The all-time peak of 6,021 MMT was in 2007. To be clear, CO2 from "energy sources" make up about 90 percent of all U.S. CO2 emissions, and the small remainder has been mostly stable during the quarter-century period involved. The Post gave Pruitt's statements a single grade of "Three Pinocchios" — "Significant factual error and/or obvious contradictions. This gets into the realm of “mostly false." The United States may have had the largest decrease in carbon emissions, but it is still one of the largest per capita emitters. Translation: Pruitt's right, but I needed to invent a bogus reason to make it look like he wasn't. ... the second largest decline during that period was registered by the United Kingdom, which reported a 170 million metric ton decline. At the same time, China's carbon dioxide emissions grew by 3 billion metric tons, and India's grew by 1 billion metric tons. Thus, I don't think it's the least bit misleading to claim that the U.S. is leading the world in reducing carbon dioxide emissions. ... The story quoted Pruitt a second time: “We have reduced our CO2 footprint by over 18 percent, almost 20 percent, from 2000 to 2014.” The Post also disputes this claim, citing EPA numbers that stated “energy-related CO2 emissions” have fallen by 7.5 percent since 2000. I am not sure why anyone is using numbers from 2000, as U.S. carbon dioxide emissions continued to rise until 2005. That’s when they began to fall. Between 2005 and 2017, U.S. carbon dioxide emissions fell by 12.4 percent on an absolute basis and by 19.9 percent on a per capita basis. The per capita number is certainly consistent with Pruitt’s claims, though the date range isn’t. In other words, the U.S. has accomplished a 20 percent per capita reduction in the most recent 12 years (2005 to 2017) instead of a prior 14-year period (2000 to 2014), meaning that Pruitt understated the per-capita accomplishment — and that the Post didn't sufficiently investigate what Pruitt said before issuing its bogus "fact check." Sure, Pruitt didn't utter the words "per capita," but given the absolute truth of his first statement, there's no way his omission of those two words and his differing time frame justify the Post's "Three Pinocchios" evaluation. Pruitt's claim is entirely defensible, and on a nuanced topic like this certainly shouldn't be considered mostly false. I think the Washington Post got this one wrong.